Female watches over her brood! 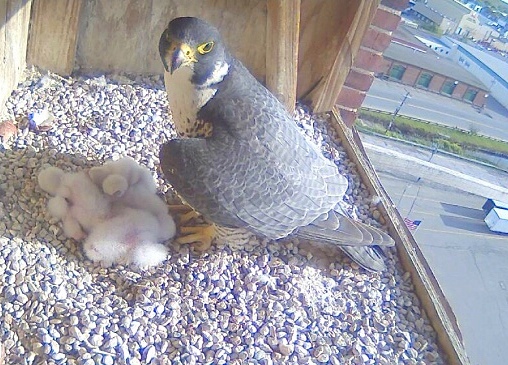 Here the female is keeping an eye on her growing brood in the nest box. In these early days, the chicks are fed and then given plenty of time to rest. 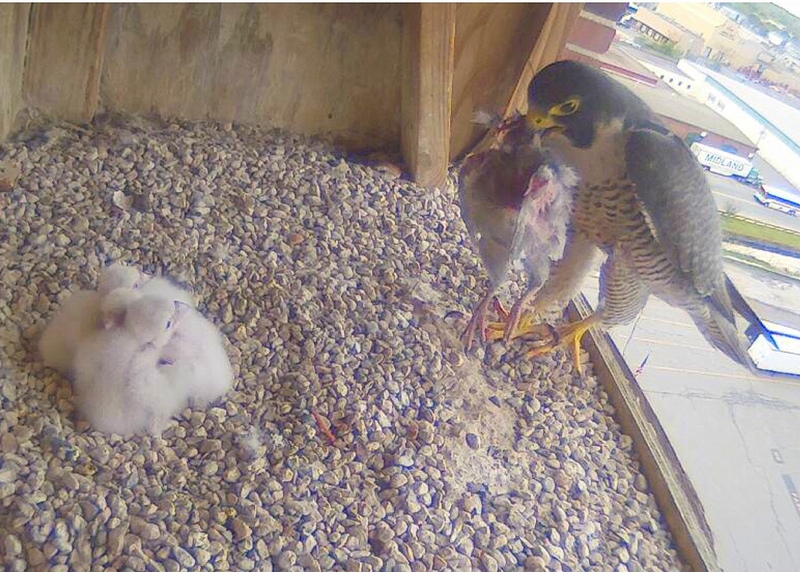 Many thanks to the New Balance team for providing this close up access to the Lawrence Peregrines! Female bringing in a fresh catch for breakfast! The chicks are eating many times each day and are growing. In between meals they tend to huddle close to one another for warmth. They always respond when the female brings food. In this moment, they had been in tight huddle, the female arrived with a big breakfast. They eagerly stretched out their necks, packed away the meal and went back to the tight huddle! The female makes sure the food is distributed fairly and tenderly. With temps in the 80’s and the late afternoon sun shining brightly into the nest box, the female provides shade to the nestlings! 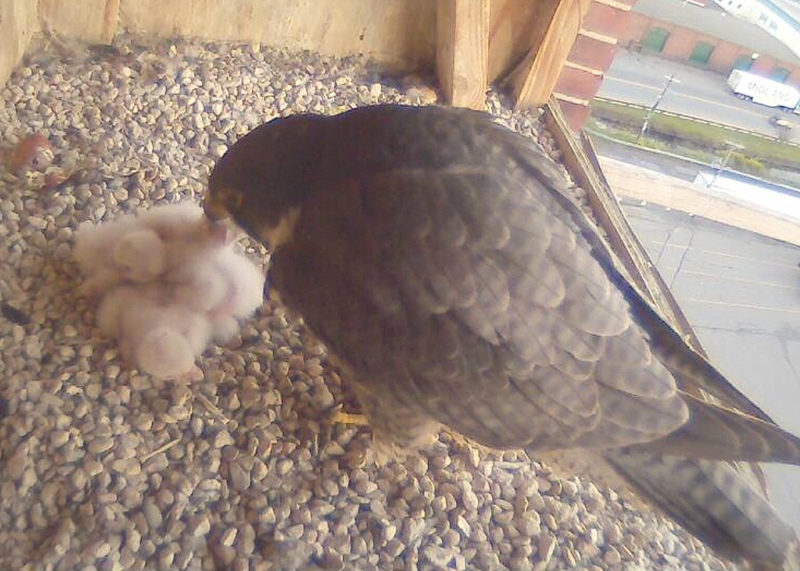 4 chicks hatched; female feeding time! 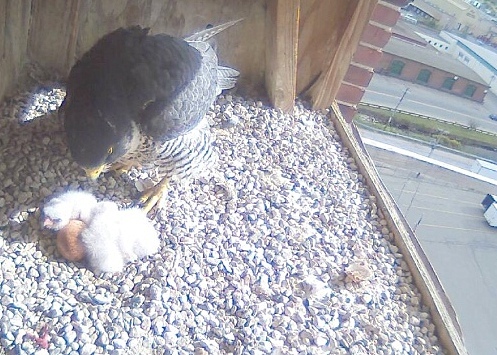 The adults begin feeding the chicks shortly after that have hatched. At this sage, their eyes remain closed, but the chicks already have the instinct to crane their necks upward for food! Most of the brooding and feeding of small young is carried out by the female, while the male hunts to supply the food. 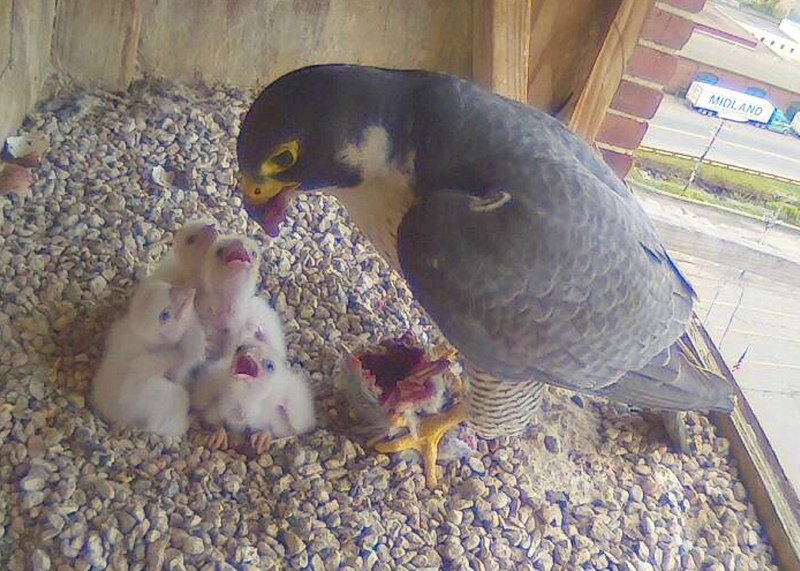 After the first couple of weeks, the female shares the hunting. Male and female feeding time; one egg to hatch! Hatching begins when the chick hammers a hole in the egg with a special “egg tooth” on the end of its beak. The bird makes a neat cut all the way around the egg, essentially cutting off the large end of the egg. This process may take up to 48 hours and requires a great deal of energy. A newly hatched falcon chick weighs about one and a half ounces (60 grams) and is virtually blind. Covered only with a light coat of fluffy white down, it requires constant brooding by the female in order to stay warm. Obtaining energy from the small remnant of the egg yolk, now neatly tucked away inside its body, the newly hatched eyas isn’t usually fed by the parents for about 24 hours. 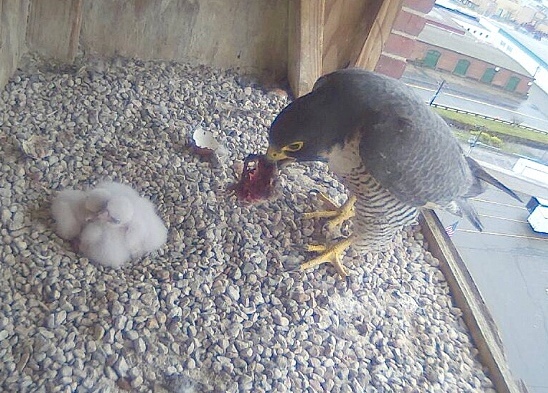 Feeding commences on day two, when the young falcon gapes and bobs its head around in search of small pieces of meat delicately provided by the female. She elicits their food-begging and feeding behavior by evoking a sharp “eeechup” call as she approaches the brood with food. 3 Chicks and one to go! Adult female, three hatchlings and one egg still to hatch! 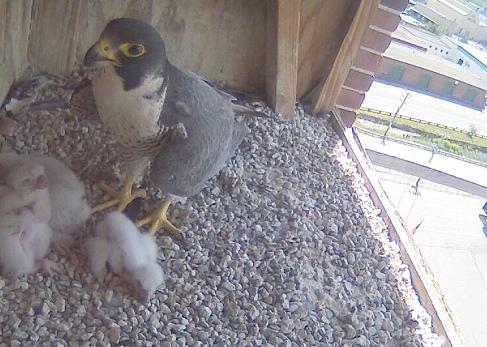 Male and female in nest box in middle afternoon with first chick hatched and other 3 eggs ready to hatch! 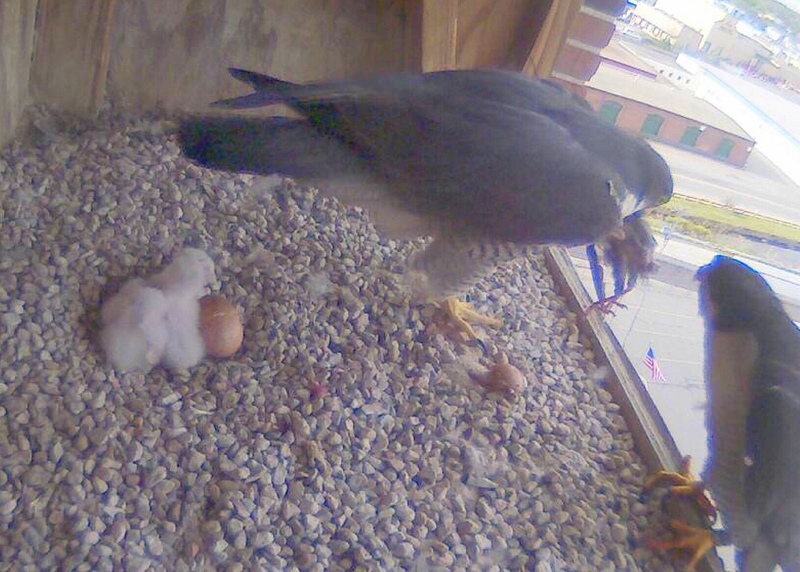 Inside the egg, the Peregrine chick has its head tucked under its wing. A large muscle called the hatching muscle runs from the middle of the neck to the top of the head. About 30 days after incubation has started, this muscle contracts. The chick’s head snaps up and the egg tooth, a hard pointed knob on top of the beak, cracks the inside of the eggshell. This creates a “pip” – a small hole with tiny cracks spreading out across the shell. One to two days after pipping, the chick begins moving around in the shell. The egg tooth scrapes against the eggshell, cutting a ring through it. 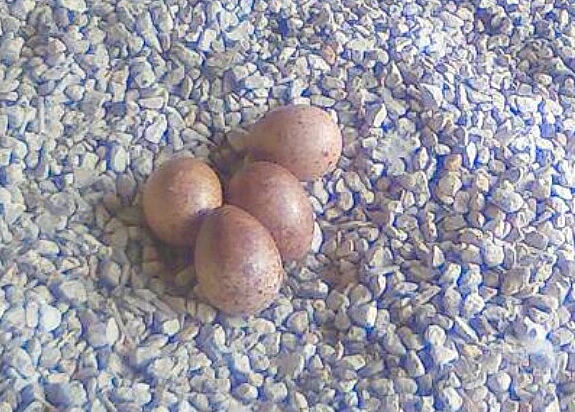 Around 31 days after the egg is laid, the chick breaks out. 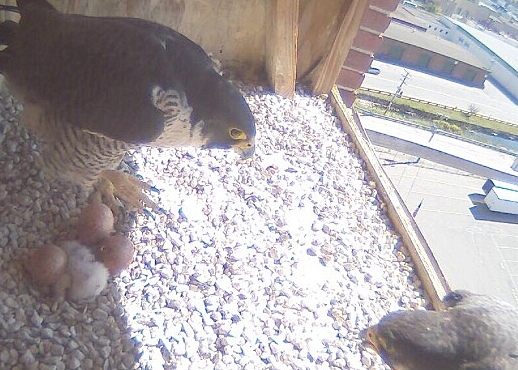 Lawrence Peregrines: 4 eggs ready to hatch! After 30 plus days of careful and shared incubation duties of the 4 eggs by both male and female, the time has come for the chicks to hatch. We are likely a day away at most from the first hatch! Here is a late afternoon view of the 4 eggs while the female is taking a regular break in the non-stop process of incubating the eggs.